The Under Secretary General of the UN Sir John Holmes visited the IDP Welfare Camps (Menik Farm) in Vauniya today promised to donate 10 million US Dollars through UN agencies to facilitate civilians shortly. 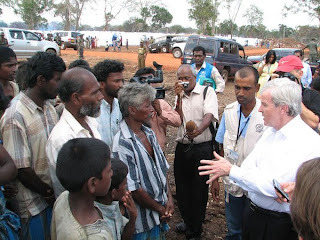 Sir.Jhon Holmes satisfied with the humanitarian mission and the facilities given by the Government of Sri Lanka to Internal Displaces People in Vavuniya who fled from the LTTE clutches. Minister of Resettlement and Disaster Relief Services Rishard Bathiyudeen also accompanied the UN envoy to visit IDP camps. Sir Holmes called on Minister of Foreign Affaires in this morning and scheduled to meet President Mahinda Rajapaksa.